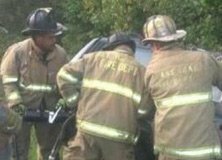 Tuesday, August 27, 2013 – Mutual Aide to Prince George’s County – BRVFD responded for a report of a MVC vehicle rollover with people trapped. Rescue Engine 113, Engine 112, PA119 and Chief 11 responded to the call. Members on RE113 used the Hurst Rescue tools to extricate the patient. The patient was taken by PA119 to the LZ at PG Co 24 which was set up by E112.